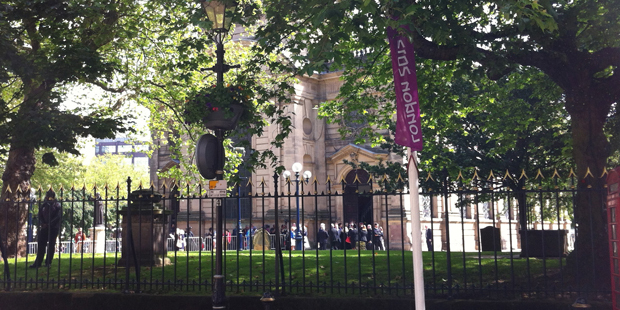 On Saturday morning the route of our regular Saturday morning walking tours of Birmingham was cordoned off in preparation for a special service. 20 US athletes and 10 Jamaican athletes were among more than 200 people at the service held at St Philip’s Cathedral. The US track and field team have been based at the Alexander Stadium whilst the Jamaican team have been training at the University of Birmingham. Of course we will be cheering for Team GB, but we will be keeping an eye on both the Jamaican and US teams and cheering for them when they are not up against a GB team member. Hope to catch the opening ceremony on the big screen in Victoria Square. The walkers gathering to start the regular Saturday morning Birmingham City Centre walking tour were treated to a steady procession of Zombies. 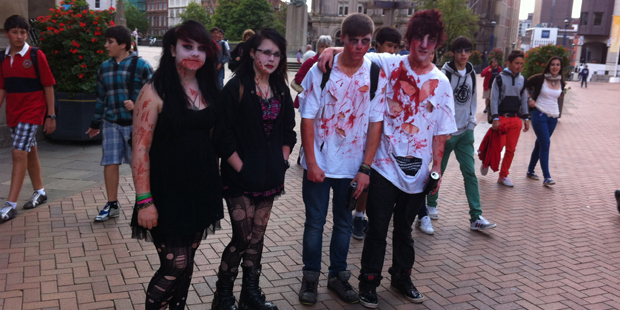 Far from being flesh eating monsters, they were raising money for charity by taking part in this the 4th annual Zombie walk, raising money for Birmingham Children’s Hospital. Let’s hope they have similar success to that of a previous series of charitable events that started in 1784. The newly completed General Hospital on Summer Lane needed funds to keep it running and for 128 years the Triennial Music Festival took place in Birmingham to raise funds and keep the hospital running for the benefit of all of the people of Birmingham, no matter what their finical circumstances were. It is the reason the Town Hall was built as the then town needed a 2,500 seater venue, Zombie numbers have been growing, 1,800 attend last years event, we look forward to hearing how many walked in the great weather this year. We will be donating half our takings for Saturday’s walk to the Children’s Hospital, and hope that the yearly Zombies procession continues its good work. With a break in the weather, 13 boys from a Birmingham Secondary School, joined one of our Ghost Walking Guides on a ghoulish walk around Birmingham City Centre. The boys heard of morgues below cinemas, 1870’s gangs and how they got their comeuppance with a public hanging. They learnt a little of the history around hanging at Winsom Green with the story of the crime of the first man to swing there. One of the boys was particularly interested to hear that a man who shared the same surname as him, met his end at the end of a rope 48 years to the day before the lad was born. Then a quick story of rioters and looters ghosts from the 1790’s, before heading off to a graveyard to hear of body snatchers and the part that young boys played in committing this crime. Finally the boys spent some time and some money in Waterstones on New Street to see what other stories they could find. I must contact the teachers and ask if one boy in particular spent his money on the book “Hanged in Birmingham”. When two of the twelve guests turned up to our specialist Sunday walking tour, 1000 tastes 1 city, with coffee from one of the chains, I had no option but to introduce the group to the thriving Birmingham Independent Coffee scene. We departed from Victoria Square walking past Ginger’s Bar to our first stop outside Purnell’s in Cornwall Street. I shamelessly retold the stories that Glynn had so generously taken the time to share with our walking group the day before. Having got them thinking about good food it was onto Urban Coffee Company in Church Street to ween them off chain store coffee. Long time Barista Simon, spoke in his soft Irish lilt to the assembled group. He spoke with great enthusiasm about each stage of the process in making the perfect cup of coffee. First choosing a single Estate bean, Columbian Tinana, grinding it to the correct size, carefully checking the temperature of the water, then carefully controlling the flow of the precisely measure volume of water through the coffee grounds. Simon then urged the group to slowly sip and taste, then to allow the coffee to cool a little before tasting again. His precise coaching, allowed the group to experience the subtleties of a first class coffee. Independent Coffee Shop twelve Chain Coffee shop Nil. 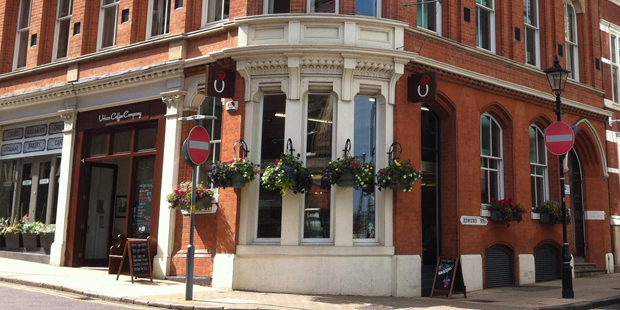 Having shared many more stories of the great brands and tastes that were born or found their way to Birmingham, and having left the group in Brindley place, I headed back to Urban Coffee Company for a cup of Columbian Tinana before heading back home. A busy day for walking tours in Birmingham today, in Victoria Square the start point for our standard City Centre Walk, the second day of the Colmore Business District Food Festival was in full swing. A quick break for a coffee from one of Birmingham’s great independent coffee shop Urban Coffee Company, followed by a three pie selection from The Old Joint Stock. 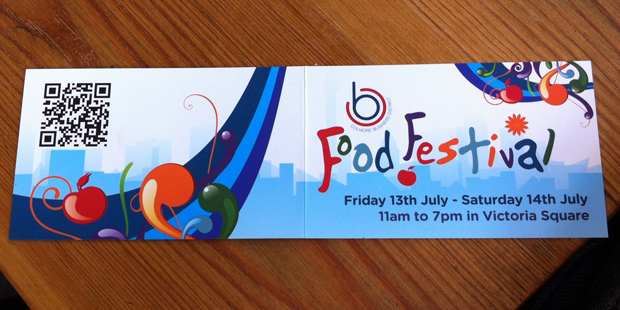 Then a quick look around the festival before going to the starting point for the food themed afternoon tour. 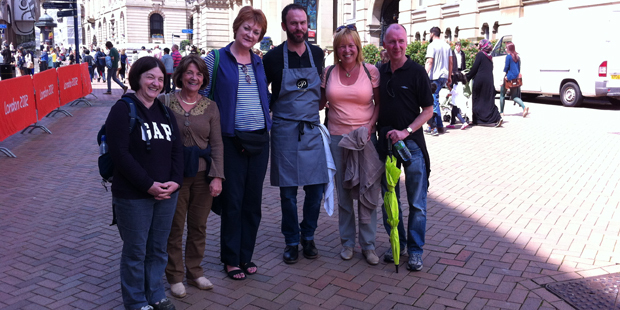 At 2:00 I met up with my guests for one of Midlands Discovery Tours specialist walks, 1000 Tastes 1 City Tour. Having spotted Glynn Purnell, described by Olive magazine as the Yummie Brummie on his food stall, I asked if he would be kind enough to come over and talk with the group, which he duly obliged. He told us how as an 11 year old he had written a note of his plans to become “a cook and have famous people at my Birmingham Restaurant”, and how the note had recently come to light when his dad found it in the loft of the family home. I asked if he could confirm that as a 14 year old he had experimented on his siblings, by putting Curry powder in their baked beans, yes he said along with onions and a few dried herbs. 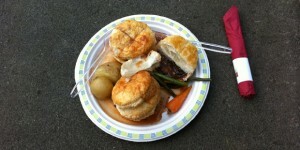 Clients today to his Cornwall Street restaurant can’t get the bean dish, as the critics of the original dish when he was 14 weren’t too complimentary, but judging by the long line of people at the Purnell food stall and of course the Michelin Star, todays experimental dishes get rave reviews from all that try them. Two hours of walking and talking built up my appetite, so I made a bee line back to Victoria Square to try the Pigs cheeks, which were melt in the mouth, followed by Raspberry’s with a beautifully delicate meringue and whipped cream. Glynn Purnell, a great chef, a champion of the city of Birmingham, and a really nice bloke. Although Andy Murray wasn’t able to stop Roger Federer winning his 7th Wimbledon Championship, Birmingham can be proud of its tennis connections. 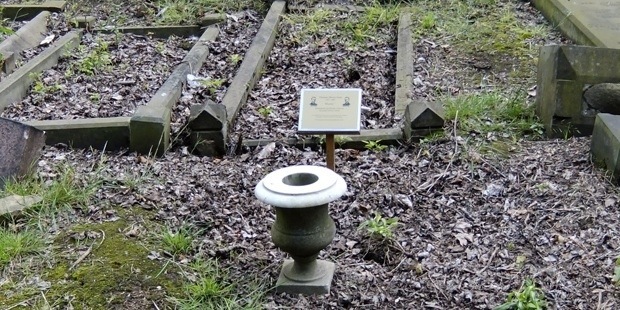 In 1859 Birmingham Solicitor Harry Gem and his friend, Spanish merchant JBA Perera, used the size of the croquet lawn in Perera’s Ampton Road home in Edgbaston and drafted the rules for the game of lawn tennis. They set up the first lawn tennis club in Leamington Spa, but were also members of Edgbaston Archery and Lawn Tennis Society, which is the oldest lawn tennis club in the world. Harry Gem is buried in Warstone Lane Cemetery in Birmingham, sadly the headstone was destroyed a number of years ago, and would have been left unmarked if it hadn’t been for the Harry Gem Project, a group of tennis fans and historians that aim to raise enough money to re-instate a headstone on Major Gems grave. In 1877 Spencer William Gore, brother of Charles Gore, the 1st Bishop of Birmingham, won the very 1st Wimbledon Championship. In this Olympic year, the tennis connections go further, in 1896 John Pius Boland a former pupil of the Birmingham Oratory School on the Hagley Road, traveled to Athens to spectate at the 1st modern Olympics. Whilst he was there he was asked if he would join the German tennis doubles player, whose partner had become ill. They made it to the final and won the Gold medal. Boland decided to enter the men’s singles and won Gold in that discipline to. 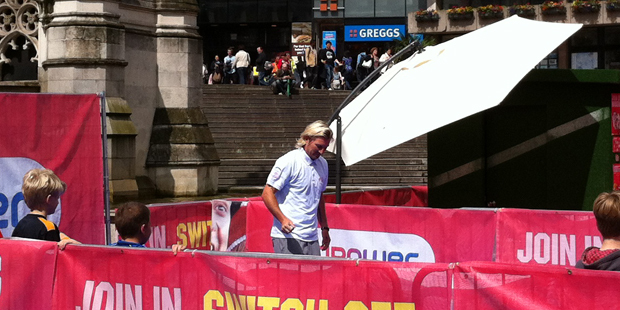 Chamberlain Square welcomes Robbie Savage. Hope he has the time to visit Vaugtons in The Jewellery Quarter where they make the Carling Cup medals. As it is finals weekend at Wimbledon he might visit the grave of Major Harry Gem, the man that invented Lawn Tennis. Both subjects are covered in our Jewellery Quarter Tour. 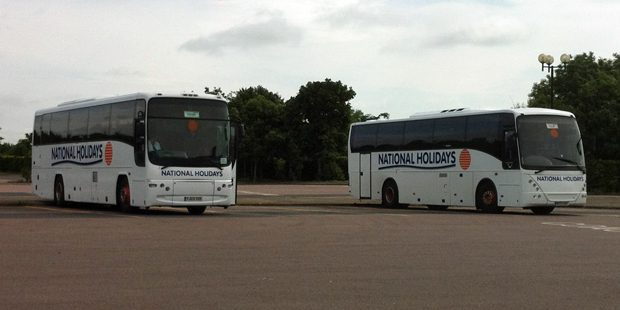 Start of regular coach tours of Stratford Upon Avon with National Holidays. Today was the 3rd time we have been asked to give a commentary on a coach tour around Stratford up Avon. Todays group from the North East are all members of the University of the 3rd age, a said how much they enjoyed the tour, not just the details of the Bard, but the circumstances around the closure of the Häagen-Dazs Ice cream parlour, and the name of the horse trainer in Wilmcote, just in case they might like to place an each way bet. 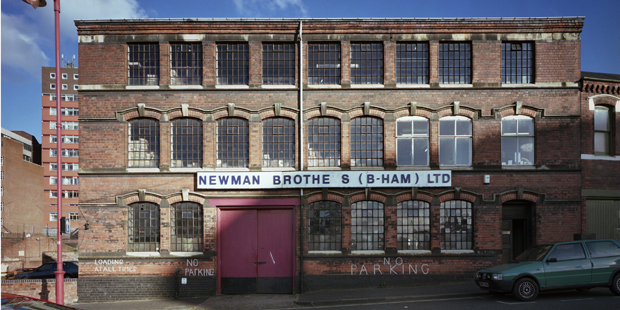 We are delighted to report that Newman Brothers Coffin Fittings Factory has been granted planning permission for the restoration scheme put forward by Birmingham Conservation Trust. We have been lucky enough to have been able to take visitors into the courtyard of the factory over the last year. 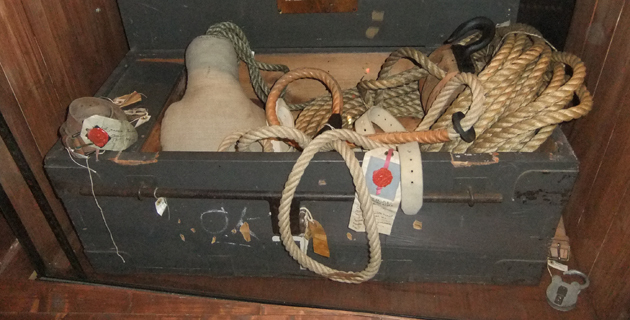 We have shared with them stories of the growth and decline of the coffin fittings business, along with processes used in the manufacture of the coffin fittings, and the stories from ex workers from the business. The visits have been the cherry on the cake of our Sunday “City of 1000 trades” walking tour and a number of private Birmingham ghost walks, that during the hours of darkness have been a great backdrop to stories of burial customs, especially as there has been not lighting in the courtyard. We’ve gift aided 10% of the ticket sales of every tour we take in there, and you can either make a financial contribution or offer help as a volunteer by going to the Birmingham Conservation Trust web site.